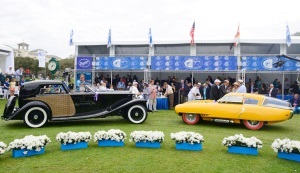 For 21 years, the Amelia Island Concours has continued to impress and entertain automotive enthusiasts with a plethora of vehicles from all walks of life. The expansive golf course show field at the Ritz-Carlton, located on Amelia Island, home of the City of Fernandina Beach, held the first event in 1996. 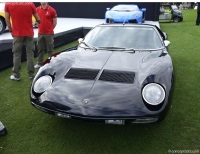 It has grown from humble beginnings to one of the nations top motoring events. This year, over 300 cars and motorcycles from 10 different countries were arranged into 43 classes. Hans Stuck was one of the most popular and successful international road racing stars of the 1970s through the 1990s. He raced in Formula 1 and Formula 2, grand touring cars, Trans-Am and IMSA's GTO Championship. In the early 1990s, he raced Porsche 911 Turbos for the championship-winning Brumos Porsche IMSA SuperCar team. Amelia celebrated Stuck's accomplishments with nineteen 'Cars of Hans Stuck.' One of the highlights was the Brabham BT45B which made a very rare appearance outside of the Alfa Romeo museum in Arese near Milan, Italy. Stuck qualified on the front row at the 1977 Grand Prix of the United States at Watkins Glen. He led the first 14 laps until a broken clutch cable caused his BT45B to jump out of gear and hit a barrier. Mr. Warner said 'We're honored that Alfa Romeo has sent this car from their fabulous museum in Arese, Italy, to honor Hans Stuck'. The 1986 Sebring winning number-5 'Coke machine' driven to victory by Stuck was also on display at Amelia. The car had limped to Sebring's checkered flag on three wheels after the left front wheel had fallen off during the final lap. The red #5 Porsche 962 still managed to win by eight laps. Two years later, at LeMans, another of Stuck's Porsche 962s was poised to make motorsport history. Stuck destroyed the LeMans qualifying record by five seconds, and was followed by Porsche's first one-two-three sweep of LeMans qualifying. Perhaps one of the most creative and entertaining classes on the field was the 'Concepts Beyond Detroit.' This was a group of concept cars that were built in period, but not by manufacturers. They were developed by individuals or companies outside the major manufacturers in Detroit. The results were innovative, captivating, and sometimes outrageous. The group at Amelia were a few of the most ambitious, stylish, and avant-garde concept cars built. They were designed with an eye toward production but with a passion for innovation. On the show field was a Mohs Safarikar, one of three prototypes built and one of two to survive. Built specifically as an African Safari vehicle, it never saw duty there. It has an aluminum body that is covered with 40 yards of naugahyde vinyl stretched and stapled over polyurethane foam padding. It is equipped with three Steve McQueen 'Baja' racing seats that swivel for comfort while driving on rough terrain. The back bench seating folds down and can sleep 2 adults and 2 children. The top is removable and coupled with the sliding doors which gave hunters protection while taking African game. The Mohs design has a very square and upright design. Many of the other vehicles on display, however, appeared to be space-age or aerodynamic inspired. The Studebaker Manta Ray Concept was built by two individuals who worked in the jet aircraft industry. Their design incorporated the swift flowing lines of a jet fighter plane. The showing of the Manta Ray at the 2016 Amelia Island Concours d'Elegance marks the first time in over 60 years it has appeared in public. Equally intriguing was the Fascination Concept. It looks like a three-wheeler, but the front spindle has two tires like on an airplane. Another concept on display that was designed to take full advantage of contemporary aerodynamic knowledge, was the Porsche Covington Tiburon. It was quickly recognized as a significant achievement and was featured in numerous magazines, even being recognized by Road and Track magazine as the most streamlined car in the world. Pegaso built just 84 cars during their life span, and the Amelia show field included fourteen of those cars. Present was the 'el Dominicano' - a bubble-top coupe built in-house in Pegaso's works for Dominican dictator Rafael Trujillo. The Pegaso Z-102 was one of the most exotic cars in the world due to its Formula 1 technology and leading edge styling and engineering. Another very special group was the ‘Trophy Cars' class, featuring eleven significant competition cars and the famous trophies they won in some of history's fabled classic races. This unprecedented display included The Borg-Warner Trophy paired with the Johnny Lightning Special, the Wheeler-Shebler Trophy with the 1909 Buick, Old Number Ten, the Harley Earl Trophy from Daytona International Speedway with the 1971 Richard Petty Plymouth Road Runner, the 1914 French Grand Prix Trophy with the 1914 Mercedes GP car, the Race of Two Worlds Trophy from Monza with the Jim Rathmann Watson Roadster, the Stevens Trophy with the Cord Beverly Sedan, the Sebring/Alec Ulmann Trophy with the Stirling Moss/Bill Lloyd 1954 OSCA, a replica of the Vanderbilt Cup with the ALCO, the Cannonball Sea- to- Sea Memorial Trophy Dash/Maurice G. Bauer Trophy with the 1975 Cannonball Dino, and two Le Mans Trophies with Ferrari bookends – the 1949 and 1965 trophies with the Ferrari 166MM of Luigi Chinetti and Lord Selsdon and the Ferrari 250LM of Rindt and Gregory, respectively. Rare appearances by celebrity cars included the Janis Joplin's 1964 Porsche 356 SC Cabriolet, which served as the centerpiece for the 'Porsche 356' class. The 1949 Buick convertible, one of two used to make the film 'Rain Man,' made its international Concours debut within the event's 'Post War American Production' class. The yellow 1952 Pegaso Z-102, owned by Evert Louwman from The Hague, Netherlands, took home the prestigious Best in Show Concours de Sport Trophy. The highly coveted Best in Show Concours d'Elegance Trophy was presented to Helen and Jack Nethercutt from Sylmar, California, for their 1930 Rolls-Royce Phantom II Town Car. The Rolls Royce has a formal limousine body created by Brewster. It was once owned by 1930s film star Constance Bennett, who saw the car at the 1936 New York Auto Show and purchased it for a reported price of $17,000. Ms. Bennett kept the car for more than a decade until her husband lost the car in a poker game.